This week, the PGA tour hits Texas, for the Valero Texas Open. This event takes place in San Antonio, Texas at the AT&T Oaks Course. Last years winner here was Steven Bowditch. That was a thrilling one for those who remember as Bowditch had a HELLACIOUS last day, where he shot +4 yet still managed to win by a stroke. The year before was also a great one with Martin Laird and Rory McIlroy battling it out. I still remember that tournament as McIlroy looked stellar and shot a 66 on the last day. But he was squeaked by Laird who shot 3 strokes less, after floating around par every day, to completely kill it and take the $1.1 million top prize. 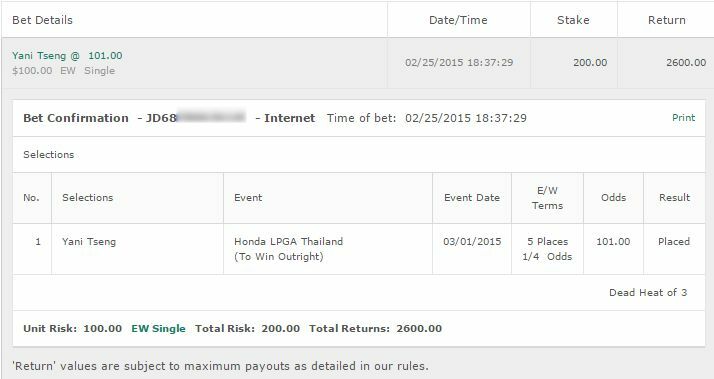 We came so close to a cash last week with Kevin Na. He was a high price and goddamn if he didn’t almost deliver. He came 6th when we needed him to come 5th or better. Let’s roll the dice with him again this week. Na is a heavy 35/1. But he’s coming into this on the back of 3 Top 10 finishes. He hasn’t cracked the top 5 in awhile and like many golfers, there’s always that possibility that he goes on a downward spiral. But he came 11th here last year so that’s something to think about. This is a bit of a risky bet – but the odds still make it good value. Bet: Kevin Na 35/1 E/W at Bovada for Americans. Two time winner Zach Johnson is coming into this one at 25/1, which is a decent price and worthy of a bet. Johnson is coming in on the back of some bad form, but has the ability on this course to be there or thereabouts. Will he get the trifecta, with a third win? It’s doubtful – but he can still battle with the best of him and we’ll be taking Johnson here in the hopes that he can find that form again. Bet: Johnson E/W 25/1 at https://www.GTBets.com. Spieth is the favourite for a reason, and if you replaced his name with Rory McIllroy based on his past form he would be a lot higher than 8/1. I mean you run this course 5 times, he’s going to win once I guarantee that, and therefore he is a good bet at 8/1. For that price however we only bet him to win, not E/W. 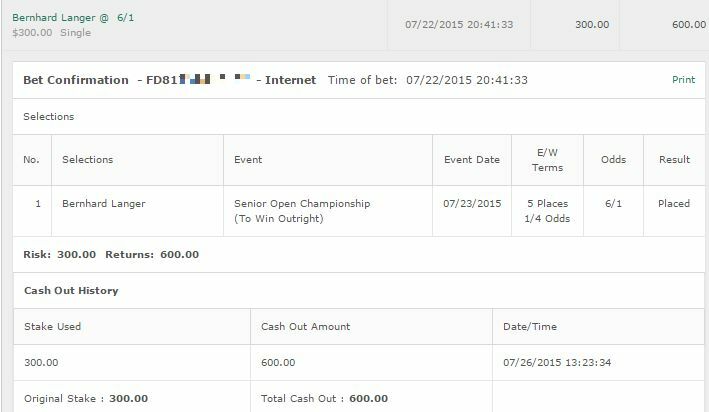 Update: Spieth jumped to 10/1 at Bet365. Bet that one E/W. Bet: Jordan Spieth to win the Valero Texas Open. 8/1 odds are available plus $200 free cash at Bovada for Americans. Holy crap was that one intense – and so very disappointing. Going into the last day, we had 3 runners. Kevin Na, Zach Johnson and Jordan Spieth were all hovering around the top 5, and it looked like we were going to have at least 2 cashes. Unfortunately Na and Zach had really bad rounds. Zach Johnson hit +4. FYI even a par would have got him a 5th place finish. Kevin Na hit +3. And of course Jimmy Walker walked away with it. Still – 3 right tips, variance on the final day is all. 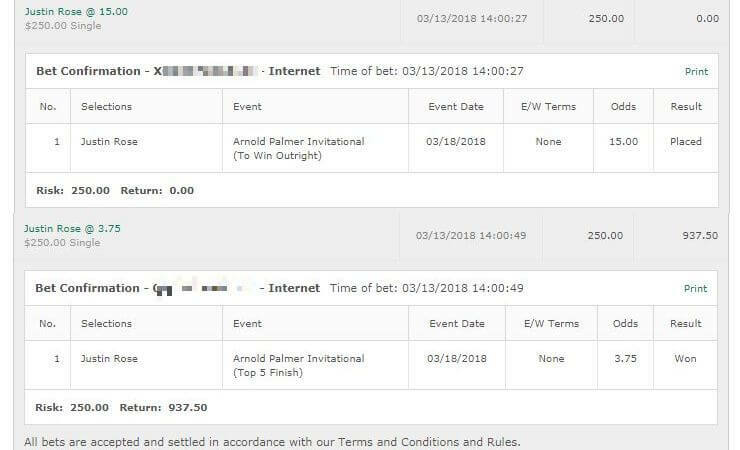 If you backed Spieth E/W you still got a cash.